A nylon check chain dog collar is a half check collar that has been designed to control your dog pulling on the lead, that uses a combination of nylon and chain for strength, that is available in various colours and sizes to fit most breeds.You may love your dog, but you don't always love their behaviour and a half check collar that is often referred to as a choke collar will give owners more control over their dog, than a traditional leather or nylon dog collar. 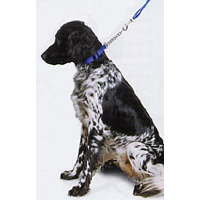 Half check collars have increased in popularity with puppy schools and dog trainers for obedience and teaching your dog how to walk to heel, as the nylon check chains shown below are a kinder way to check your dog during training on the lead and release quickly around your dog's neck, after their behaviour has been corrected. When your lead is attached to the ring of the nylon check chain, if your dog pulls away from you, the collar will tighten enough to remind your dog who's in charge, without damaging his or her throat. This is a simple and well proven method for training your dog not to pull, but if the problem persists try a Halti which is also available on this website, which trains in a completely different way. The nylon check chain collars are chrome plated and strong, each link is welded, an essential feature of a high quality check chain dog collar, making these half check collars ideal for obedience training. The collars are also adjustable so you can vary the size of the collar to fit your dog's neck accordingly, by using the buckles to lengthen or shorten the collar size. We also stock leather check chain collars suitable for stronger, larger dogs, please visit the following page of the website to view the Leather Check Chain Dog Collars that are available in black or tan! 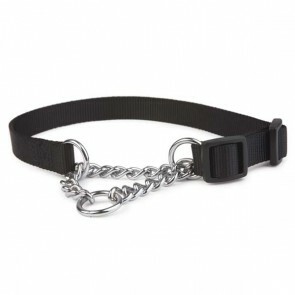 Nylon Check Chain Collars: 5 stars out of 5 based on 2 user reviews. I have a very large Neapolitan Mastiff and was finding it hard to get a Nylon and Check Chain Collar to fit him. Came across your website and found the perfect size for him which is 30". Placed my order on Sunday evening and my order arrived first post Wednesday morning. I am very pleased with the serve I have received from your company and when he runs out of food and bones will be ordering from you because we have found your prices very competitive.